Revenue in the Luxury Eyewear segment amounts to US$5,975m in 2019. The market is expected to grow annually by 2.3% (CAGR 2019-2023). In global comparison, most revenue is generated in United States (US$9,007m in 2019). In relation to total population figures, per person revenues of US$7.90 are generated in 2019. Luxury Eyewear is comprised of eyewear frames and sunglasses. The overall market definition follows the Consumer Market Outlook’s Eyewear market, while here only the super-premium to luxury price range is considered, and lenses and contact lenses are excluded. In comparison to the luxury core categories of Leather Goods and Watches and Jewelry, Luxury Eyewear is comparatively affordable with designer eyewear providing an entry way for many consumers into the world of luxury brands. The shown market data are based on an analysis of more than 100 of the biggest luxury companies in the world. A complete list of all companies and brands covered can be found in the methodology description. Sales by smaller companies or artisanal production unaffiliated with the companies covered are not included. All data are shown at retail value, which includes markups for retail distribution and sales taxes. Italy’s vertically integrated Luxottica is the biggest player in Luxury Eyewear. Apart from owned brands like Ray Ban and Oakley, sales of licensed brands are a main source of revenue for Luxottica. Among others, it holds licenses for Armani, Burberry, Dolce & Gabbana, Polo Ralph Lauren, Prada and Tiffany. Reading Support Revenue in the Luxury Eyewear segment amounts to US$5,975m in 2019. 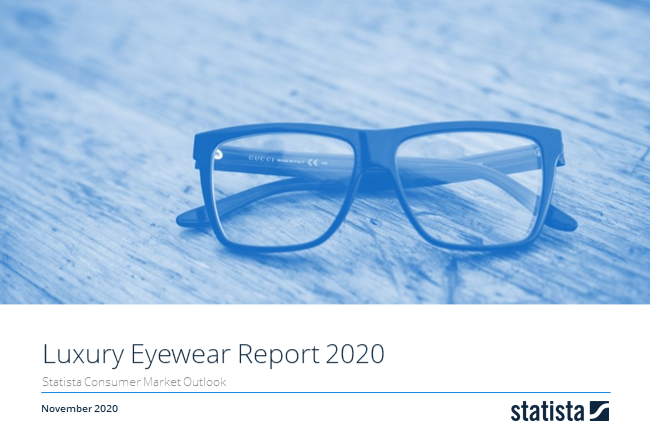 Reading Support The Luxury Eyewear segment is expected to show a revenue growth of 2.4% in 2020. Reading Support The average revenue per person in the market for Luxury Eyewear amounts to US$7.90 in 2019. Reading Support With a market volume of US$9,007m in 2019, most revenue is generated in United States. Here you can find more studies and statistics about "Luxury Eyewear".